Letter U - Bigjigs Rail Name train letter. 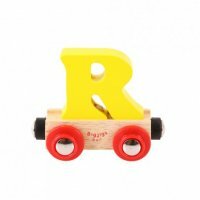 This wooden Rail Name Letter makes a wonderful gift for youngsters or as a keepsake for newborns. 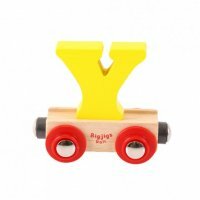 This carriage is magnetic and can be added to other letters and trains. 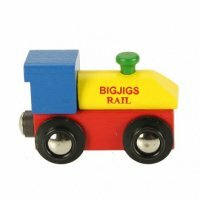 It also runs on Bigjigs Rail wooden train track and is compatible with other leading wooden railway brands. 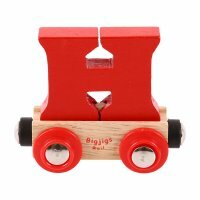 There are six colours of letters available red, blue, yellow, green, orange and purple, please state childs name in the notes section when you checkout and this will help us select the colours of train letters for you. 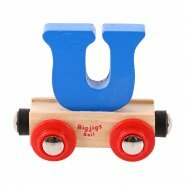 We recomend the My First Train Set with the Rail Name, if you do purchase these together you will not need an Engine. Also great to use around or on a birthday cake.